Voting has begun in Russia's third presidential election since the collapse of the Soviet Union in 1991. Eventually 95,000 polling stations will open across 11 time zones, from the far east to Kaliningrad on the Baltic sea. There are six candidates, but President Vladimir Putin is expected to secure a landslide victory. Correspondents say only a turn-out of below 50% - which would invalidate the poll - could stop him from cruising to a second term in office. But election officials in the far east, the first region to vote, said the turnout there had been higher than expected. In a bid to avoid a low turnout, Russia's political and religious leaders have appeared on national television, urging citizens to perform their civic duty. Mr Putin called on people to use their vote wisely. "People must realize the level of responsibility when they make their choice," Putin said after casting his ballot with wife Lyudmila in southern Moscow. "People's feeling of responsibility will certainly grow as long as they see that much depends on their choice." Voters have also been offered incentives to cast their votes, from vouchers for free haircuts for pensioners to cinema tickets for young people, Reuters news agency reported. One student in the far eastern city of Vladivostok told AFP news agency her class could only be entered for a trip to China if they all voted. "I need an official note confirming I voted, so that my class can take part in the contest," said Yelena Smirnova. However, not all Russians appear to have been moved by the gestures. "I definitely will not vote in these elections," one woman told Reuters. "Everything was decided for us a long time ago." Security is expected to be tight around key installations such as airports, military sites and power plants, as well as along the Chechen border. Strict security is also planned for Moscow, with up to 22,000 police and troops patrolling the Russian capital following a series of bombings in recent months blamed on Chechen rebels, French news agency AFP reported. 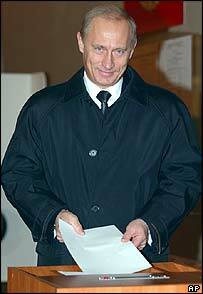 Opinion polls have showed Mr Putin has an approval rating of around 70%. The Russian leader announced that he was not running an election campaign and that he would simply rely on his position as president to show the nation what he had achieved. However, BBC correspondent Stephen Dalziel in Moscow says Russian state television has made President Putin a regular feature of its broadcasts - while in contrast his rival candidates have had little coverage. "Mr Putin did his best to look a little worried"
Is Putin good for Russia?